The boys are at the Hamilton Ti Cats game this afternoon (too chilly and rainy for me LOL). So while they are gone I have been having a super productive afternoon in the craft room!! Three challenges for my design teams and about 10 more Christmas cards so far!! I made this card with the intention of entering a washi tape challenge - but of course, I missed the deadline...ah well...will just add it to the growing stash of Christmas cards. UH OH! This is what happens when you show up wearing Calgary Stampeders colours!! The Ti Cat mascot takes "eat em raw" seriously!! I am SO used to missing deadlines. I'm now running 1-2 weeks behind. CUTE photo of your boy wearing the wrong colors. HA! Yep, I get all these great ideas only AFTER the challenges end. SONOFA! Your card ROCKS, Donna! Love it, and fabulous pics of Joel! I am awesome at missing challenge deadlines! 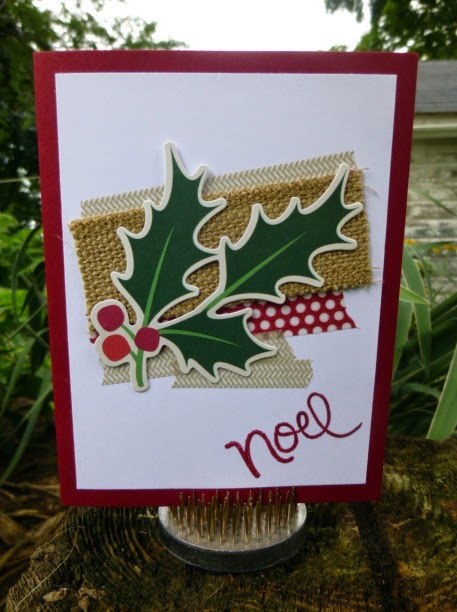 Embrace your strengths, lol :) I love the burlap - and seriously, how you've managed to create a collagey CAS card? Genius.